Like everyone else I was very saddened by the events in Paris on Friday evening, and my thoughts and prayers are with those who have suffered, their friends and their families. Yet, if anything, that sadness has been deepened by some of the responses to the attacks. So I'd like to put together some thoughts on what has happened. 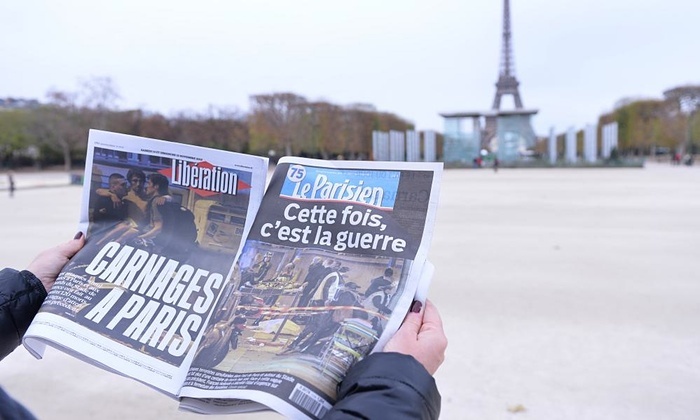 I'll start with one of the headlines above, "This time, it's war", a sentiment which echoes and is entirely in line with François Hollande describing the attacks as an "act of war". Such statements seem oblivious to the reality that France has already been "at war" with Islamic State for some time. For the past few months it has been attacking IS on a daily basis. These French attacks are every bit as much "acts of war" as the attacks in Paris on Friday. In fact, their cumulative effect is almost certain to have been much more deadly and more destructive than Friday's attacks. France cannot conduct acts of war in foreign countries without making itself a target. Neither can the UK, the USA or any of the other countries which are involved in attacking Islamic State. We in the West have developed a very distorted view of what war is. We try our best to confine it to foreign fields, far away. Then, to try and make it more remote and minimize our casualties, we are reticent to put troops on the ground ... so we attack from the air instead. And, to make it more remote still, we are increasingly making these attacks by drones, controlled by operatives hundreds, if not thousands, of miles away. In some cases it has become a "normal" job. You live at home, commute to work for the start of your shift, sit at your console piloting drones, probably have lunch and coffee breaks, then either commute straight back to your family, or perhaps get together with friends over a meal or a few drinks. In these ways, we sanitize war. But war is neither sanitary nor sane. And when the bloody reality of what war actually means in terms of bodies and blood is done to us, we are shocked. We shouldn't be. We cannot attack others without expecting them to try and attack us. Of course saying this doesn't in any way justify what happened in Paris. Attacking those who attack you is perfectly justified, but Friday's attacks were specifically targeted at civilians, not combatants. In contrast when our forces attack Islamic State (or any other enemy in any other conflict) they will, I am sure, make reasonable efforts to direct their attacks only at strategic military targets. But, even so, I would suggest that our attacks are nowhere near as precise as our leaders would like to make out when they make public statements, and this is all the more so as a direct result of trying to engage with an enemy remotely from a distance, rather than directly on the ground. I would not be at all surprised if the number of civilians we, the West, have accidentally killed over just the past few months in our attacks on Islamic State is rather greater than the number of civilians they deliberately killed on Friday. In moral terms there is a huge difference; but the end result is still that innocent people pay the price. And even then, there are grey areas. We may not deliberately target civilians, but what room do we leave as a margin of error? Even if we were to hit our targets 90% of the time, is 10% a sufficient margin of error? Here, the sheer scale of what we are doing changes the equation completely. If we conduct fifty missions a day against IS, it is (in practical terms) the equivalent of conducting five missions deliberately targeted at civilians every day. The reason this is allowed to happen is probably because our leaders can't think of a better alternative. Public pressure makes them think we have to do "something", but what we are doing is almost certainly making the situation in Syria and Iraq worse rather than better. I would offer these thoughts. • First, why do we feel we have to be involved at all? Without doubt Islamic State is a despicable regime that does abhorrent things. But there are a number of other regimes in the world that are just as bad. We don't attack North Korea. We don't attack Saudi Arabia. In fact our double standards are such that UK governments count the Saudis as friends and sell them weapons. I think it is all but certain that the Saudis are discretely funding Islamic State, because they see what is happening as primarily a Sunni/Shia conflict. Yet I would not say that we shouldn't be involved at all because we must face up to the fact that we, the West, are directly or indirectly responsible for a large part of what is wrong in the region; whether as a relic from the colonialism of a century ago, or as a direct result of our invasion of Iraq to topple Saddam Hussein. • Second, if our involvement in Iraq has taught us anything, it is that the borders which the colonial powers imposed on the Middle East are arbitrary and largely unworkable. Iraq has a Shia population in the south east, a Kurdish population in the north, and a Sunni population in the west. It was only able to function as a "united" state to the extent that one faction (in this case the Sunnis, led by Saddam Hussein) was able to subdue the other population groups, often by means of atrocities. Yet, even after we had toppled him and replaced his regime with a so-called democratic government, that government just played another variation of the same game. Democracy can only work where people have a real choice between alternatives, and are free to vote one way or another depending on what the parties offer. All that happened in Iraq was that Shias voted for Shias, Kurds voted for Kurds and Sunnis voted for Sunnis; they could not reasonably be expected to do anything else. But that is not democracy, it is sectarianism. The Shias, as the majority in Iraq, naturally led the new government ... and proceeded to repress the Sunnis with almost the same vigour as they themselves had been repressed under Saddam Hussein. Given that repression, it is hardly surprising that Sunnis in Iraq would feel that they needed to be protected from the new Shia-led government in Baghdad. If we call Islamic State a terrorist group, it is worth reminding ourselves that such "terrorists" can only survive with some degree of tacit consent from the population they claim to represent. For many Sunnis who felt repressed by Shia-led governments in Baghdad, any Sunni-led regime would be better ... even Islamic State. The situation in Syria has many parallels with Iraq. In broad terms, Syria has a Shia (Alawite) population in the western coastal area, a Kurdish population in the north, and a largely Sunni population elsewhere; but the Sunnis form a large majority. Just as was the case in Iraq, Syria is only able to function as a "united" state to the extent that one faction (in this case the Shias, led by Bashar al-Assad) is able to subdue the other population groups, often by means of atrocities. Note that I have used exactly the same sentence as I used before. One of the often-repeated refrains of western leaders has been that both Saddam Hussein and Bashar al-Assad have committed atrocities "against their own people". By and large they haven't. Their atrocities were largely against the other population groups that they were trying to subdue. So, for what it's worth, my conclusion is that there is no way in which either Iraq or Syria can function as successful states within their current borders. This is a reality that the West needs to grasp, particularly if we want to see functioning democracy in the region. The problem faced by Western governments is that we are fairly clear about who we are fighting against, but not who we are fighting for. In Syria, we are against Assad and we are against IS. A few years ago we were more against Assad, now we have swung round to be more against Islamic State. If put on the spot, I'm sure that our leaders would say that they want to see a "moderate Syrian opposition" come to power in place of Assad's regime, preferably by democratic means. But a Syria of that sort cannot work as a democracy, just as Iraq cannot work as a democracy. Sectarianism prevents it from happening. If there were elections in Syria under its present borders, all that would happen is that the Sunni majority would vote for a new Sunni-led government, and the Shias and Kurds would then feel repressed by that government. Syria would be a mirror-image of Iraq. Perhaps, up until a few months ago, the replacement of Assad's regime by a moderate opposition might have seemed at least a remote possibility; but things have now changed because of Russia's intervention. Unlike the West's intervention, Putin has the great advantage of knowing what he is fighting for, as well as what he is fighting against. He supports Bashar al-Assad. The simple reality is that Russia will not let the Assad regime fall. The reason for this is very obvious: Russia has a naval base at Tartus and an air base at Latakia, both on the Syrian coast in the Shia-populated region. This article in the Moscow Times reports on plans to expand Russia's presence there into a unified military base. So, unlike the West, Russia knows what it is fighting for, already has troops on the ground, and is prepared to put in more, as many as it takes. I don't think Russia has any particular fondness for Assad or for Shia Islam, but it has a practical working relationship that it does not want to put into jeopardy ... and it certainly would be in jeopardy if a Western-backed "moderate" regime were to take over in Syria. Perhaps Assad himself might go, but the Russians will ensure that if and when he does, he is replaced with someone who will continue the existing arrangement. We in the West might not like the fact that Russia is determined to maintain a strategic military base in the eastern Mediterranean; but with UK military bases in Cyprus, we are in no position to complain. Faced with this reality, I believe there cannot be a unified democratic state of Syria within its current borders. But we might be able to achieve a stable, and even democratic, solution by changing the borders along these lines. From my perspective, the best place to start is with the Kurds. One of the great injustices of colonial rule is that the Kurds do not have their own state. After the collapse of the Ottoman Empire the Kurdish-populated territories were split between Turkey, Syria, Iraq and, to a lesser extent, Iran. They have been mistreated and subject to cultural repression ever since. But, apart from historical injustice, it makes sense to support them in purely pragmatic terms. The Kurds are currently our best military allies against Islamic State, and by far the best hope of establishing a functioning democratic state in any part of the present day territory of Iraq and Syria. For their part, the Kurds are certainly not afraid to fight against IS, but are probably wary of being used by the West, only to then be dumped by the West once our immediate objectives have been achieved. We might be clear about the need to fight against IS, but need to take a leaf out of Russia's book and decide who we are fighting for as well. We need to publicly commit ourselves to the establishment of a new Kurdish state (or perhaps a confederation of Kurdish states in Iraq and Syria) and we then need to give them the assistance necessary to provide that state with the security it needs to protect its borders. This would mean a proper army with heavy weapons such as tanks and a proper air force. As I see it, this state would be limited to the current territory of Iraq and Syria because in practical terms it would be impossible to alter the borders of Turkey or Iran. Yet if, as I hope, this new Kurdish state were to be a democracy at peace with both Turkey and Iran, the borders between Kurdistan and the Kurdish-populated areas of Turkey and Iran would be less problematic. The next border adjustments would need to divide Shia- and Sunni-populated areas in both Iraq and Syria. Iraq has shown us that democracy cannot work if one population group is perceived by the other to be dominant. Yes, this can happen in mature democracies, but we must recognize that democracy is something new to this region. The protection of minorities that is fundamental to the way western democracies work takes time to develop. It is a mistake to think that democracy can be imposed overnight just by holding elections. There is more to democratic societies than merely holding elections and letting whatever majority emerges continue to act in the same way as the previous dictators did. I'm less sure of how the Sunni/Shia divisions might work than I am about the borders of a new Kurdish state: but in Iraq the Shia state would be the southern third of the present Iraq, including Baghdad but not extending further north; and in Syria it would be the coastal strip north of Lebanon. The remaining area of both western Iraq and eastern Syria would be predominantly Sunni. There could be one state with a capital in Damascus and one with a capital in, say, Mosul; but I don't really see why it should not be a single state, as the current border between Iraq and Syria is nothing more than an arbitrary line on a map from the "e" in Acre to the last "k" in Kirkuk, reflecting only what Britain and France wanted for themselves a century ago rather than what anyone in the Middle East wanted then or wants now. In this one respect, Islamic State have a reasonable objective. There is much to commend a single predominantly Sunni-populated state in the territory that straddles what is now western Iraq and eastern Syria. It might even be worth fighting for. The problem is not the borders of such a state, but the intolerant, blood-thirsty butchers that currently control it. but what does it all mean for Wales ...................... ? Parochialism is alive and well, I see. There is more to the world than just Wales, you know. But if all you care about is Wales, then I would note that one of the major difficulties in establishing new independent states is the general unwillingness of the "international community" to accept any changes to the status quo. World leaders see it as "their club" and they don't want any upstart new members. We still have people like Cameron and Obama talking about replacing Assad with a leader for "all the Syrian people". Once they realize that this is a forlorn hope (as well as a betrayal of the Kurds who have been doing the bulk of the fighting on the ground) and accept an independent Kurdish state, it will help "normalize" the idea of new independent states ... and that will make life easier for Catalunya, Euskadi, Scotland and even, dare I say it, Cymru Fach. What does it mean for Wales? We have home grown Jihadis down in Cardiff in case you haven't noticed. Cardiff has the largest Muslim population of anywhere in Wales and that population will grow as more people join relatives already established there. It would be nice to think that Wales is separate in the minds of our Muslim population and that we are untainted by any animosity that they may feel against the UK because of its involvement in the middle East. You can't guarantee that that is the case; as the Muslim population of our capital grows tensions may also grow. I don't see why any growth in the Muslim population of Cardiff, or anywhere else, should lead to a growth in tensions, 07:22. Yes, some people from Muslim backgrounds commit acts of terrorism. But did we become afraid of Christianity or Christians because some people from Christian backgrounds were committing acts of terrorism in Britain at the height of the troubles in Ireland? Cardiff, Newport and Swansea all have growing Muslim populations. Incidentally the community in Cardiff is very much aware that they live in Wales and in a Welsh society (although most of them feel British as well) and some of them, for whatever it's worth, have voted for Plaid Cymru. The whole international issue IS to do with Wales and a handful of Welsh people have gone to join the extremists. Wales must tackle racism.